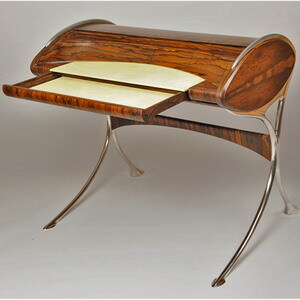 Congratulations to Marc Fish for winning the 2011 Claxton Stevens Prize with his exquisite and brilliant L'Orchidée desk. This highly prestigious annual award is given for the best piece of guildmark winning furniture from the preceding 12 months, it is the furniture equivalent of the Top-Gun Trophy. The L'Orchidée desk is particularly important because it is simultaneously fresh and contemporary and yet unmistakably Art Nouveau inspired. The elegant sweep of the aluminium legs, invite you to the desk in much the same way as a ballroom dancer would invite his partner to the dancefloor; slightly bowed, arm extended with one toe pointing outwards. The drawers inside the desk are crisply dovetailed from aluminium and walnut. The use of Aluminium and the shape of the tambour invoke the beginnings of speed and streamlining. Yet here we are a century on, in a streamlined high-speed future beyond their wildest dreams, still unable to detach ourselves from the classical beauty of highly figured English Walnut. Marc has broken new ground by using a veneered tambour to create a seamless solid surface that behaves like fabric. Historically this is not Art Nouveau because it has never been done before, but stylistically it is a perfect fit. Anyone can make a piece of 'Art Nouveau style' furniture that is no more than a copy of something old. What Marc is doing here is different, he is not copying Art Nouveau, he is harnessing it and using it as a stylistic tool to push new boundaries. If others are able to follow his lead, this piece could very well be one that defines furniture style for the next ten to fifteen years. Blonde, French and Horny !! !